HP, the world’s top PC manufacturer, is back with a brand new announcement concerning a newer range of consumer desktop computers that will come in sophisticated designs – after all, who would want to have boring rectangular looking machines on their desks that seems like a relic from the past? No sir, HP is beyond that, having invested time and money in decent design without sacrificing on the kind of technology within. Offering clean lines, soft forms and contrasting materials, the redesigned HP Pavilion desktops are able to live up to today’s style and preferences, looking comfortable regardless of whether it is on a dorm-room desk or stashed away in a media cabinet somewhere. There is a glossy (can you say fingerprint magnet?) black front panel that has been layered over a metallic base, adding depth and dimension to the new towers, while sliding front panels will keep your ports and drives hidden away until required, giving off a polished, clean appearance. There will be several models that offer a valet tray that has been integrated into the top of the PC and will come equipped with USB ports to make it easy to access, considering how so many modern day devices rely on USB ports as an alternative charging experience. 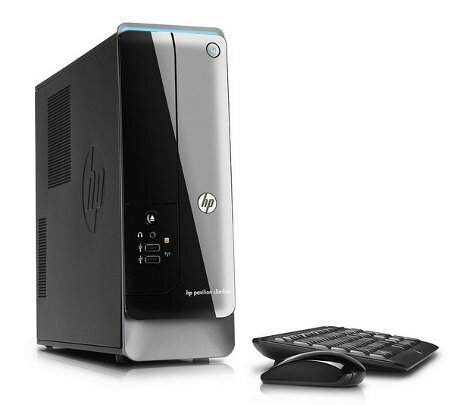 Among the new machines in the HP Pavilion consumer desktop family would be the HP Pavilion p7 series PCs that delivers generous hard drive space, premium graphics, and built-in support for multichannel surround sound. Touted to be out this Wednesday from $299.99 onwards, it will also arrive at select US retailers later this June. As for the HP Pavilion Slimline s5 series PCs, those are less than 50% the size of conventional PC towers, albeit not losing any of their configurability in order to deliver maximum storage and processors so that it can support even the most demanding multitaskers. Out this June 15th from $329.99 onwards, we will now move on to the HP HPE h8 series PCs that come with up to three internal hard drives, a choice between AMD Phenom or Intel Core i7 processors, high-end NVIDIA or ATI graphics, and the ability to support multiple displays. Pricing will start from $599.99 upwards from this Wednesday onwards. Time to make that upgrade, no?